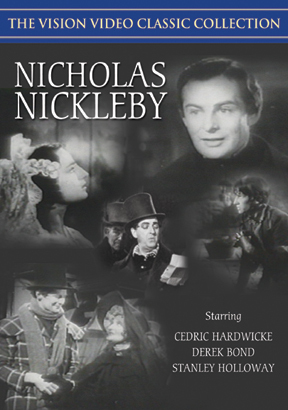 After the death of his father, Nicholas Nickleby (Derek Bond), and his mother (Mary Merrall) and sister (Sally Ann Howes) are cared for by his greedy uncle Ralph (Cedric Hardwicke), who accepts the duty rather unwillingly. Ralph arranges for Nicholas to get a job at a notoriously brutal school for boys, where he befriends one of the ill-treated students, Smike. He and Smike flee the school and join a theatrical troop. Nicholas then has to protect Smike, while trying to stop his Uncle Ralph from taking advantage of his sister and later his sweetheart, Madeline Bray, whose father is in debtors prison. Also starring Stanley Holloway, Alfred Drayton, Cyril Fletcher and Bernard Miles. Directed by Alberto Cavalcanti. Black & white.